- 6-7 attackers into the box. - #11, #9, #5, #4 & #7 all begin on the goal line. - #11 just a few yards off of the goal line at the back post. - #6 at the penalty spot. - #8 out wide making a late run to show for a short corner. 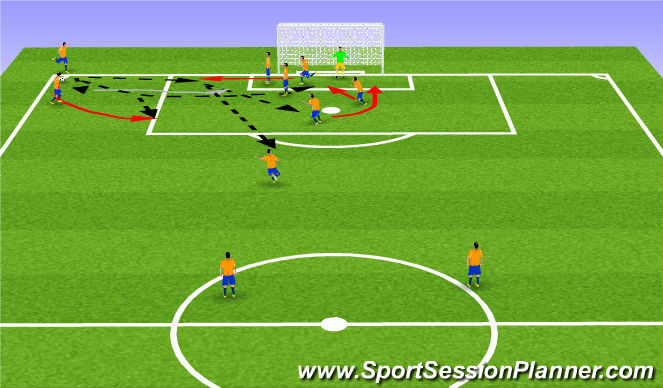 - This starting point makes it difficult for defenders to know where the runs will be made. - #7 at the corner of the 6 yard box to flick a near post ball onwards. - #4 finishes near the line at the near post. - #9 finishes central on the 6 yard box. - #5 finishes slightly behind the back post on the 6 yard box. 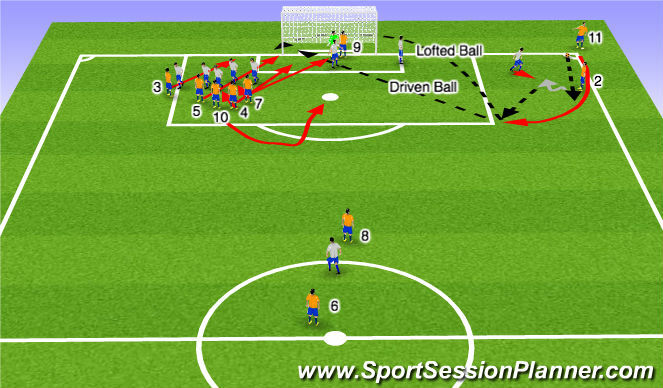 - #11 finishes 12 yards high, outside of the back post, not allowing anything to carry out past that area, but can continue run 12 yards high more centrally depending on where the ball is coming into. 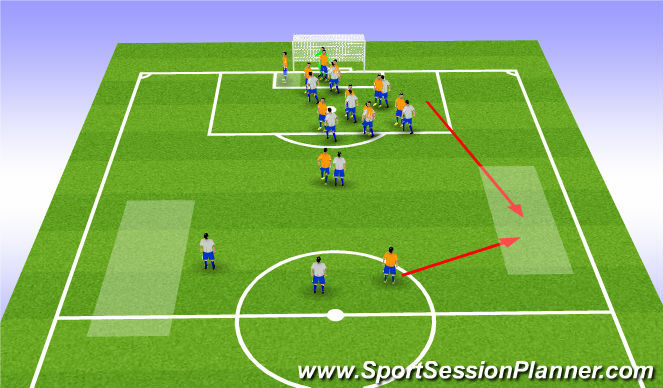 - If a short corner occurs, all players should repeat the initial runs and not stand in one place. The group of players set up outside of the far post to creat space in the box. 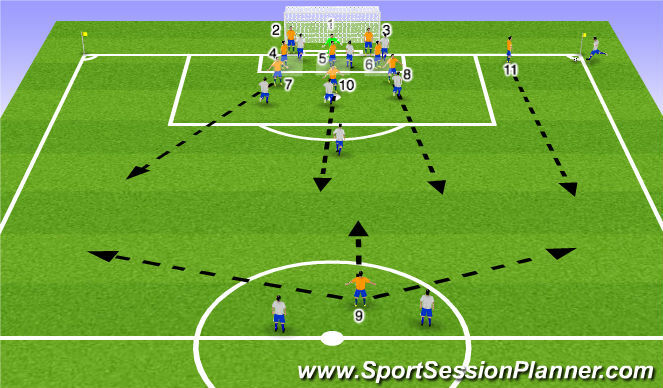 Corner taker determines if there is space to play make an overlaping run around 2 then holds both arms up. 2 cheks into corner as 11 plays ball then overlaps towards corner of 18. 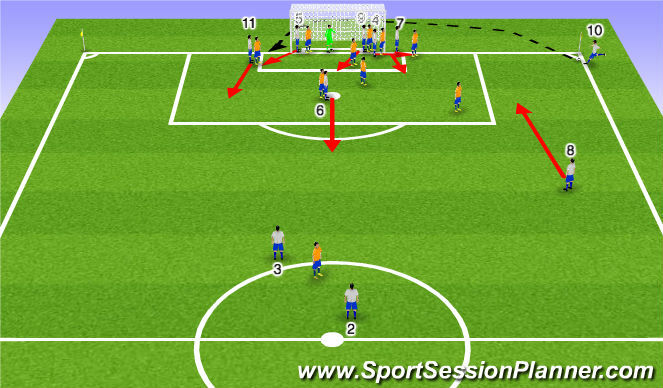 2 forces defender to commit to him (If defender tracks 11, 2 dribbles into box. If defender commits, 2 plays into 11). Decisions are made as to continure combination play, cross or shoot/play driven ball. #2 & #3 Protect the posts. Two players placed on each post to clear shots off the line that beat the keeper and cover the keeper if they attempt to punch or catch the ball. #11 (#7) Disrupt the kicker. The defender stands 10 yards from the player taking the corner kick to prevent the ball from being driven to the near post, or tries to block the kick by jumping, so forcing the attacker to play the ball differently. The #11 (#7) takes responsibiliity for short corners also.